The Starlite Room, or Jim's Starlite Room, is a family restaurant serving greasy comfort food in the same place for 50 years and counting. 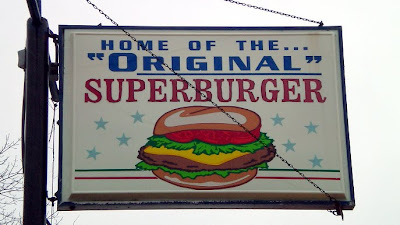 Little blue stars are behind the burger in the sign, another banner claims "Great Tenderloins". They have a multi generational customer base in this section of Cedar Rapids that keeps the place filled with large groups eating burgers and fries and other fast foods. Location: 3300 1st Avenue Northeast in Cedar Rapids, Eastern Iowa. Directions: First Ave is the main route from downtown Cedar Rapids to Marion and place beyond. The Starlite is in an old strip mall behind a Dairy Queen. The Tenderloin: This felt like a good seven ounces when I picked it up. 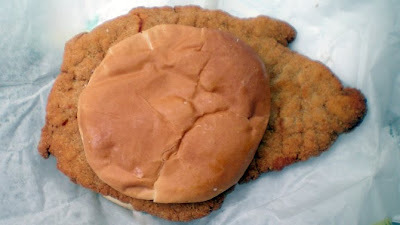 Breading was a thick layer covering a triangle shaped loin. 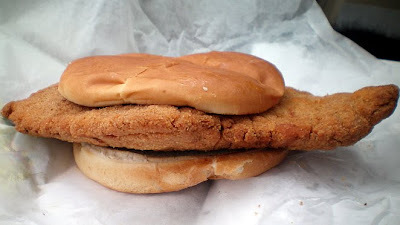 The good thick white meat had steam coming out of it that permeated the breading and the bun. The loin had been tenderized significantly by hand. Served on a large toasted bun, Overall 7.5 out of ten. 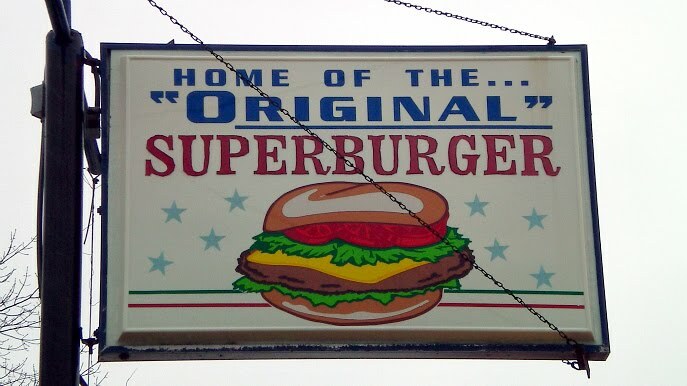 Also on the menu: the half pound "The Superburger" seems to predate the recent gourmet or upscale burger trend by a few decades. The rest of the menu is filled with fried stuff and other sandwiches. Service: I grabbed takeout from the bar area, but there is table service in the dining area. Ambiance: This location has been here for a long time and the interior is split into a bar area and a dining area with booths that was filled with families when I visited. Wood paneling, flatsceen televisions, a fortune-telling machine, and ugly electric signs dominated the interior of this neighborhood dive. 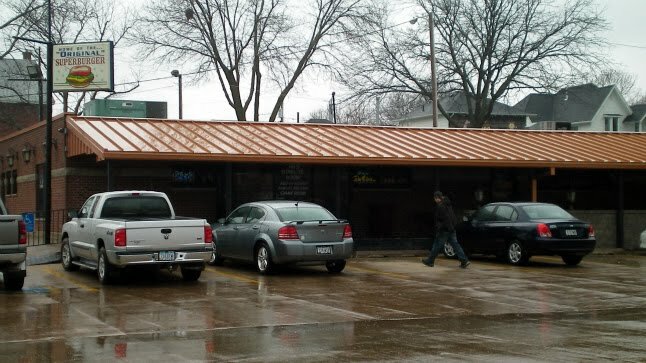 Final Thoughts: The Starlite keeps its crowds coming for its friendly atmosphere and superior fast food cuisine. 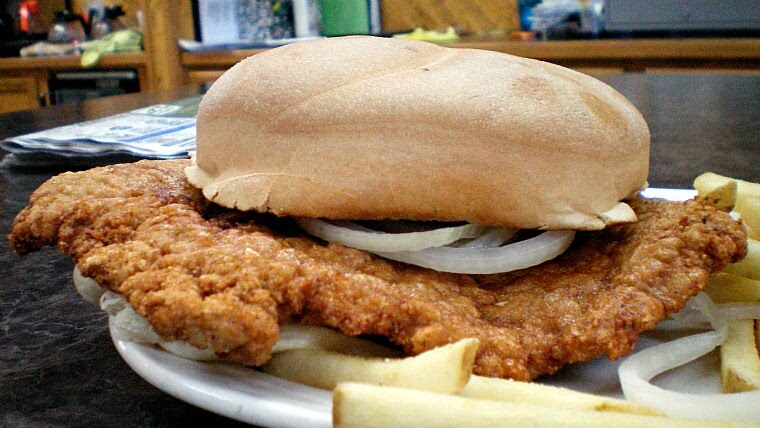 I've slowly been making my way through Cedar Rapids tenderloins and my only real disappointment has been the Tic Toc Restaurant. My next stop in Cedar Rapids will have to be the reopened kitchen at the Little Bohemia bar that has been on my list for years now. This longstanding comfort food diner is wedged in between student apartment buildings and the UNI Campus in Cedar Falls. For a college town, this place felt like a meeting place for the older townies. Location: 1724 W 31st St in Cedar Falls, just south of the UNI campus and the UNI Dome. Directions: Its about four miles north of Highway 20 just off Hudson Road in Cedar Falls. Look for the tall sign. 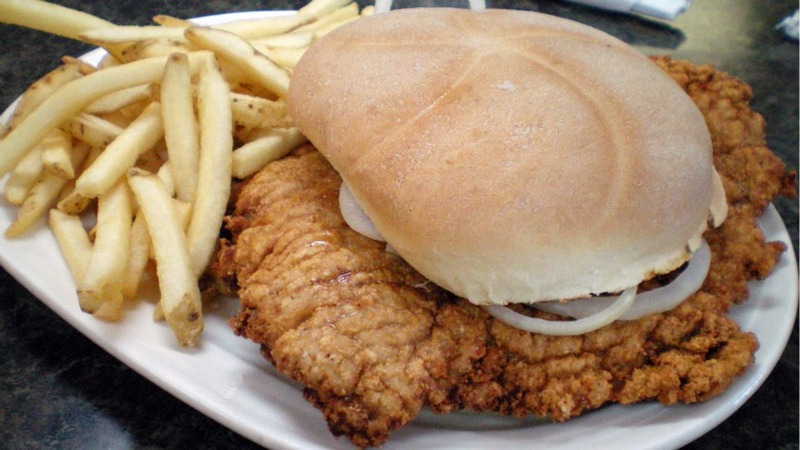 The Tenderloin: Described on the menu as 14 oz. and lean cut pork meat. The point of distinction here is that the large cut of pork loins is trimmed of fat completely. This makes a big difference when you are eating a super jumbo tenderloin. 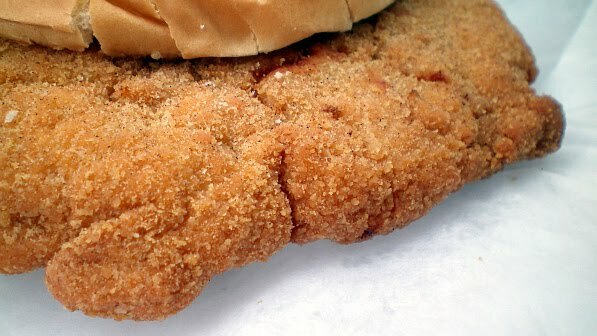 The breading is just a thin golden brown layer that gets moistened by the steam in the meat. 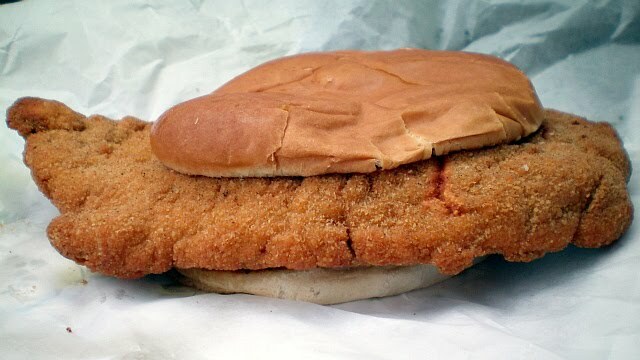 Served with your choice of fixings on a huge fresh baked bun. Overall 8.0 out of ten. Also on the menu: The menu is huge with breakfast, baked goods, broasted chicken and daily specials. They have a loosemeat burger named "J's MADEWRONG", a cheese stuffed "JUICY J's BURGER", along with classics like hot ham or Rueben sandwiches. Service: there is a small counter but most people get table service and eat in booths. Ambiance: This place shows its age. Its not old enough to have a nostalgic appeal like an older diner would, and its kept clean. But it still has tons of wood paneling and a baked goods display. Final Thoughts: The dictionary definition of homestyle food from Google reads "Such as would be made or provided at home; simple and unpretentious". 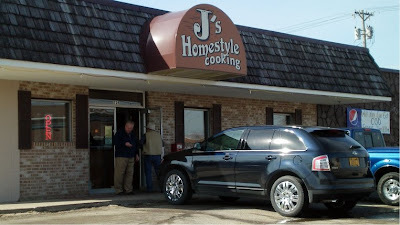 One of the online coupons for this place claims "We put the HOME in HOMESTYLE". 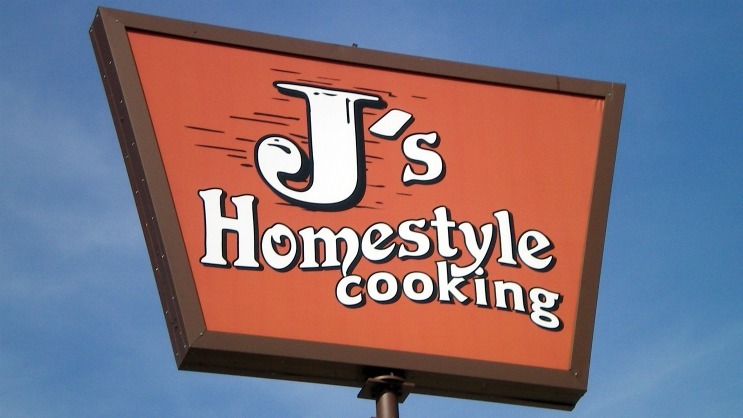 J's Homestyle is like eating at a grandmothers house, from the decorations to the cookies.